Size: 1851 sq.ft. - 3897 sq.ft. The Spires (RERA ID – P52100000485) is a joint venture between Naiknavare Developers and Pride Construction. The builders are headquartered in Pune & Bangalore cities. The construction work was commenced in 2013 and is now ready for live in. The Spires consists of two high rise towers Building A & Building B reflecting real aristocratic lifestyle. It has a different range of apartments to offer you. These towers are sprawled over the area of 2.01 acres with brilliant internal and external amenities. This is the first residential project in Aundh Pune to have this kind of development with the uninterrupted view of the river and scenic view. This development by top housing construction companies brings you lavish accommodations starting from 3.55 Crore to 4.20 Crore. It is more than an enticing and alluring concept to capture your imaginations. The Spires belongs to those having eloquent taste and seeks for what they want. 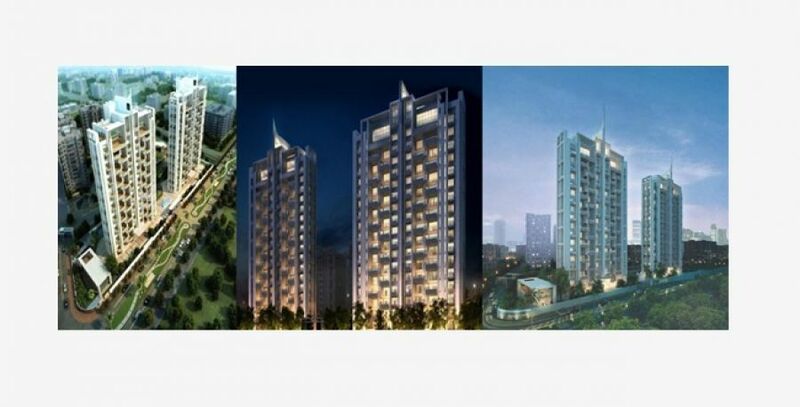 These twin towers are having 18 floors with ultra-premium amenities and specifications. The homes of The Spires are immersing in the richness available with the bedroom sizes of 3 BHK & 4 BHK and 5 BHK & 6 BHK Penthouses, about 100 Units in total. The 3 BHK types ranging at 2543 Sq.ft of carpet area, 4 BHK ranging between 2814 to 3380 Sq.ft, 5 BHK Penthouse carpet area starts from 5332 Sq.ft and 6 BHK Penthouse is 5950 Sq.ft. Each creation of Naiknavare Developers including The Spires clubbed with the best of best specifications from Flooring to Balcony to Kitchen to Bathrooms/Toilets to provisions for electric wiring/switches. This is another pinnacle by Naiknavare is situated right off the banks of Mula River enveloped into greens across the street. Aundh location is also known as the blessed suburb of North West Pune. The Mumbai City is just 140 km from here while its neighbourhoods like Deccan (9 km), Aditya Birla Hospital (10 km), Hinjewadi IT Park (12 km), Pune University (5 km), Pune Station (11 km), Airport	(18 km) and many essential places is in proximity to the development location. Aundh, Pune is one of the Historical places where in 1817 the Battle of Khadki took place, connected to several central locations like Kothrud and Koregaon Park. Aundh is divided into two parts i.e. the old Aundh gaon and newly developed suburban localities like Gaikwad Nagar, Sindh Society, National Society and many others. With the demand driven by home buyers and IT Professionals Aundh have been rapidly developing with large number of IT Companies, residential and commercial properties. The Spires by Naiknavare and Pride is near Medipoint Hospital at Aundh – Baner Link Road in Pune, Maharashtra – 411007. Naiknavare Developers entered real estate market in the year 1986 with a vision to create commercial spaces, residential spaces, business centres, schools, hotels that uphold quality. Considering themselves a Service Industry to provide service in creating and delivering a better living to clients. The milestones of the group includes Aloma County – Irene Tower, Park Dew, DMart, The Dwarka School, Prathama, Dorabjee Store in Town Square, Silent Orachards and more as such. Apart from these Naiknavare Developers is linked with a vast number of professionals. About 2 decades ago this Bangalore based firm “Pride Group” had started their journey in construction sector where they have delivered Industrial Buildings, Housing Complexes, Bridges, Road, Boundary Walls, Pharma Units, Water, Sewage and Effluent treatment plants, Commercial Buildings etc in Bangalore, Pune and Mumbai. The Spires complex is grabbing its clients attention with the amenities like Attractive Entrance Plaza with Water Body, Landscaped Podium Garden, Party Lawn, Partially Covered 65 feet length Swimming Pool, Separate Kids' Pool, Jacuzzi, Multipurpose Hall, Automatic Elevators with Access Card, Air-Conditioned Gymnasium, Jogging Track, Rainwater Harvesting, Children's Play Area, Barbeque Area, Seating Pavilions, CCTV Monitoring in Common Areas, Multipurpose Court, Piped Gas Connection, Garbage Disposal System, Genset Backup for Common Areas etc.